April 09, 2019 at 6:07 am. 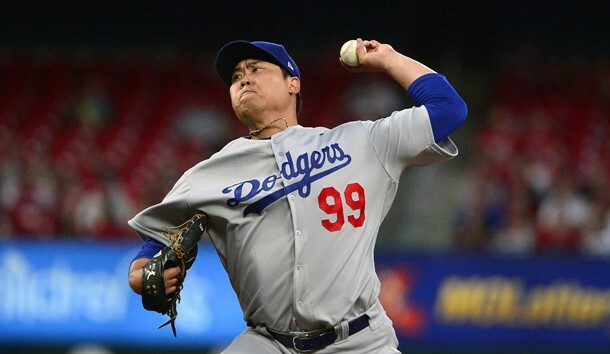 Los Angeles left-hander Hyun-Jin Ryu exited his Monday road start against the St. Louis Cardinals due to a left groin strain, and he will go on the injured list Tuesday, Dodgers manager Dave Roberts said. Last year, a torn left groin muscle sidelined Ryu from early May to mid-August. The 32-year-old South Korean entered Monday’s game 2-0 with a 2.08 ERA through two starts this year. The Cardinals got to him Monday for two runs on two hits and a walk in 1 2/3 innings en route to a 4-3 victory. Ryu went 7-3 with a 1.97 ERA in 15 starts for Los Angeles last year, then was 1-2 with a 5.21 ERA in four postseason starts. For his career, Ryu is 42-28 with a 3.19 ERA in 100 career regular-season appearances (99 starts).